We are always looking for fun handwriting activities! 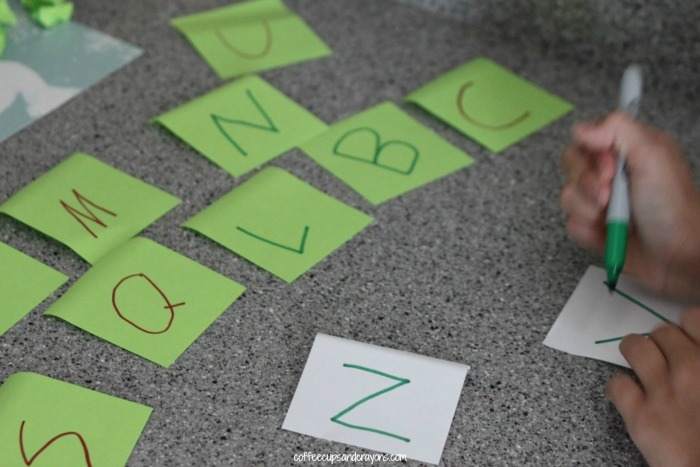 Writing letters and words over and over again can get boring so we decided to turn letter writing into a move and learn activity. My preschooler went all around the house finding letters and then writing them on her paper. It’s simple to set up and can be played over and over again. Woo hoo! 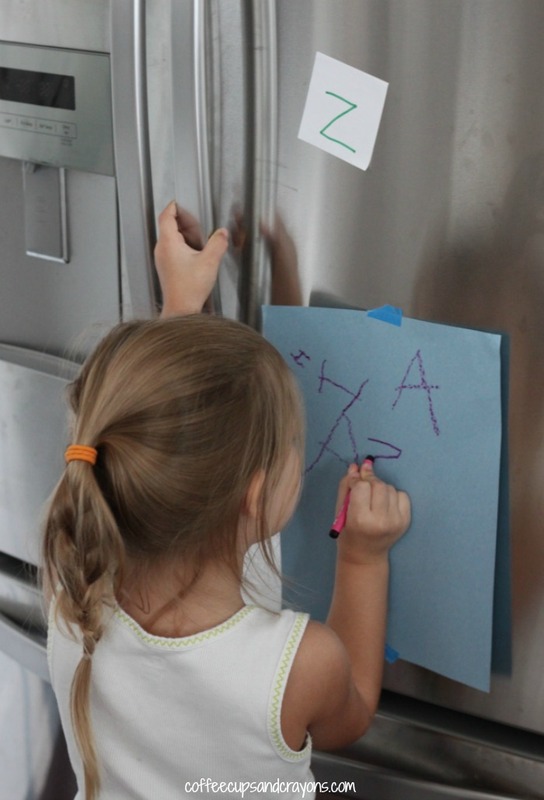 My oldest wrote letters on post-its to stick around the house but any type of letter cards or even ABC magnets would work too. We started by hiding the letters in her name since those are the ones she is to most comfortable writing and then let her add in some other ones. She loved running around the house looking for letters to write. We will be going on a Find and Write Scavenger Hunt again…maybe next time with sight words! This one is soooo easy! I cannot believe I never thought of it before because we are always looking for writing practice ideas! This is so great & super easy.. idk why I haven’t thought of this lol. I can’t believe it took me so long either!!! This one will be enjoyed by Aarya as well. I love fun easy ideas like this! I’ll try this with my Gwyn tomorrow, thanks! I am doing this for our activity tomorrow, awesome idea! What a great idea! 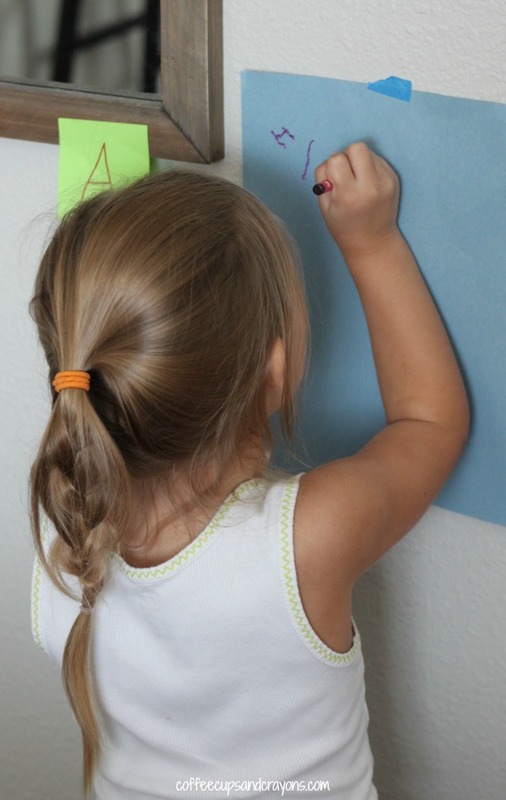 Not only is she moving her muscles as she moves around but it looks like she’s building a variety of writing muscles by writing on flat surfaces or vertical surfaces. We have to give this a try! Sight words are a good idea too! Yes!!! She needed some vertical practice and all of the “standard” activities weren’t catching her interest. When she asked for a letter hunt the timing was perfect! Thanks so much Jackie! Rebekah it is one of those simple ones I can’t believe we hadn’t thought of sooner! Thank you!